Ask any grunt who served in Vietnam - - when the firefights got tough, we could always depend on the cannon-cockers to help us out. Whether they called in steel rain from tube artillery, or called in helicopter gunships, they were always with us, and always ready to support us. They were truly brothers-in-arms, and remain so today. These three men served as part of the forward observer team with C 2/5 Cav in 1969. Left to right: Doug Hendrixson joined the company in March of 1969, serving as the forward observer until September. Dan Bertram replaced Doug in September 1969, and served until December, 1969. Charlie Dickey joined the company in May 1969 and served with us until February 1970, serving as Recon Sergeant with both Doug and Dan. 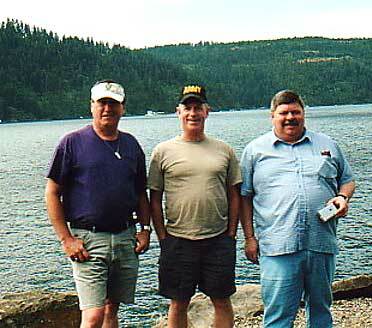 The three of them were reunited in July, 2002, with lake Coeur d'Alene in the background. Charlie Dickey was raised in the Coeur d'Alene area. He was originally from Spokane, WA, which is just 20 miles or so west of Coeur d'Alene, ID, and he worked in a mine in Kellogg, ID, just 30 miles to the east. Dan flew in from Columbus, OH, and Doug drove up from Denver.